Greetings everyone, and welcome back to The Dark Library. Don?t forget your torches at the door while you head towards the center lobby. This week I will bring you more from the Tome – Lost Creatures & Cultures of Sanctuary. Now let?s begin. Inside the Tome this time I found another interesting and lost creature. This race of cyclops was known as the Desert Cyclops. 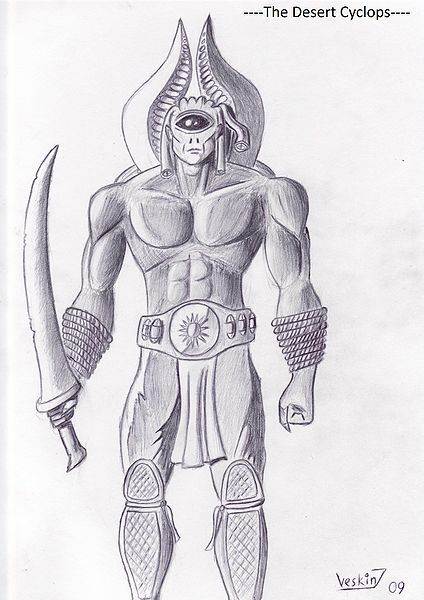 With abilities to blast with sun rays from their large eye on their forehead, and combat skills. These guys were formidable in the desert when an unfortunate soul wanders to close to their territory with ill intent. Here’s an artists rendition of the creature. Take a look while I read some info about it. As the name shows the desert Cyclopes live in the desert, mostly in the sand areas and the areas with moving sands. They lead a nomad way of life in the borders of the desert, but some of them, with voyager souls, travel out of the desert and they can be found far away of it, even in snowbound mountains. Thanks to the big horns coming out of the back of their shoulders the Cyclopes can easily ?dive? in the sand and move underneath it and after that they pop up next to their victim and attack it from an ambush. Next up I’ll read for you another chapter from Winds of the Kae Huron. This time it is Chapter 7: Concerning Hell. Listen as I read a little from the beginning. M’avina remembered the strange, hellish portals that Baal had summoned up from the earth to bring in reinforcements from the Burning Hells. Many of the Barbarians had thrown themselves into those portals to deal with the beasts within, but most of the original expedition decided against it. Once in Hell was enough. Even thinking about it brought back visceral faces of balrogs and hag demons. Jalal, Dimoak, and Aldur – the three Druids who had journeyed from Scosglen, had held a strange s?ance whenever they encountered those portals. They had said no words and made no gestures. They just stood at opposite points several feet from the edges that disappeared into fire and shadow. That is all I have for you this week everyone. I’ll share some more history from this old Tome as well as some more stories in the library. Don?t forget to put out your torch at the door and leave the wood piece in the collection bin. Next week we will bring you more from the fan fiction community in the same conveniently posted bitesize format as well as some works from fan monster and fan class creators. If you have made fan fiction that has not yet been posted in the Diablo fan fiction forum, or just got inspired to do so, head over there and post your material, or ask questions to other fan writers regarding lore, writing style or other input. See you next week! You’re all wrong. It’s going to be DA NINJA. No, not the assassin type ninja. I’m talking about a small, scrawny, screaming, glasses-wearing nerd with jeans too small, who screams “NINJA!” whenever loot drops. And then naturally running off with said loot. while giving you the finger.